Developed a model for dependent lifetimes of components in a system, which enables efficient simulation for large dimension problems and can be used in a wide range of applications, including modeling credit risk. Co-authored the paper "Marshall-Olkin Multivariate Exponential Distributions, Multidimensional Levy Subordinators, Efficient Simulation, and Applications to Portfolio Credit Risk". To be submitted for publication. 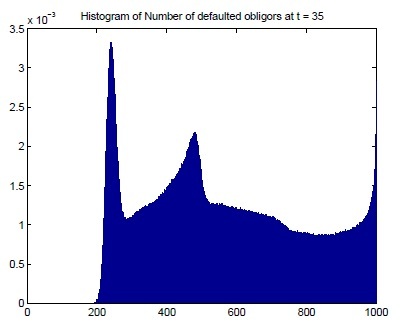 The right figure shows the special feature of distributions of the default counting process at a specific time. Will develop a bottom-up CDO pricing model based on it, and calibrate the model to market data. This project uses stochastic modeling techniques to model aircraft value depriciation. In addition, its aim is to provide a model based pricing stardards for aviation leasing industry. My job was to lead a historical data analysis on aircraft value using VBA and Matlab. The objective was to use least square and maximum likelihood estimation to estimate the model raised by Prof. Vadim Linetsky. The work successfully supported his presentation to aviation industry. 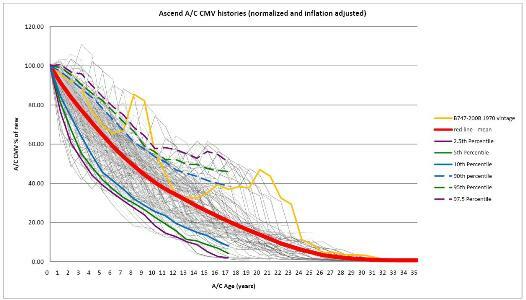 At figures to the right, hudreds of thin grey lines are corresponding to normalized and deflated historical data of different aircraft models. Our Stochastic model successfully fitted in historical data, and it is pretty robust. Under various situations in reallity, we need to estimate the conditional expectation quantaties to access a system, yet usually . This project aims to find an effcient allocation of computational resourses to estimate this quantity based on outer and inner level simulation. As an example, we consider estimating the variance of the profit and loss that a trading strategy would produce, by simulating the strategy before actually using it. At outer level, we simulate the underling stock price, which we call scenarios, while at inner level, we simulate the trading strategy we would use given the scenario. 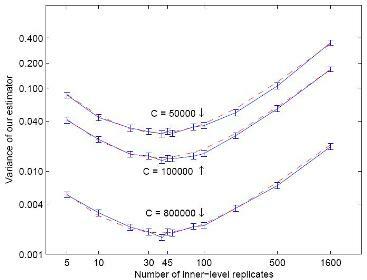 Shown in the figure to the right, the variance of our estimator has a lowest point with respect to the number of inner-level replicates. Strikingly, it is not as big as many people originally thought. 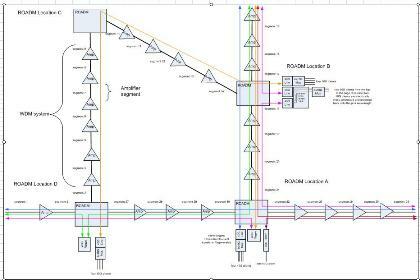 Using this efficient simulation, we would reduce simulation time dramatically. Co-authored and submitted the paper ��Efficient nested simulation for estimating the variance of a conditional expectation�� to Operations Research. The paper was accepted by the renowned journal in Aug 2010. This is an summer internship project for Coyote Logistics, the number one fast growing third party logistics company in the United States. They need a pricing tool to predict a resonable price to help their traders when they negotiate with carrieer side. The method is based on geographical weighted regression combined with optimization algorithms. Data were from their database over the past 3 years of operation. 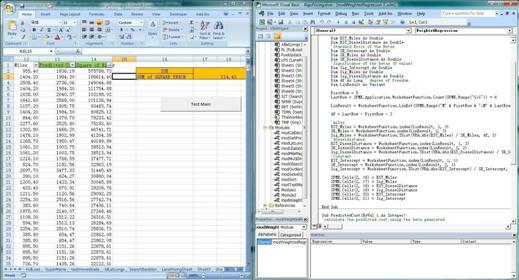 The code were basically done using VBA combined with SQL as well as a little bit of SPSS for testing. The new pricing tool increase around 22% out of sample predication accuracy than the old one they already have. The IT group of the company implanted the code into their core database and management software for futher inquiry from their traders and their customers. The project provides an optimal solution to positioning a seriers of emerging communication devices on the existing network of a leading communication network company. While pursuing the lowest cost, the solution will satisfy various communation technical requirements. The modeling is based on linear mathematical model. The implematation is under Python.